In 1951, the Pictou County Regional Library Board was established when the Towns of New Glasgow, Pictou, Trenton, Westville, and the Municipality of Pictou County united to provide library service. The Town of Stellarton joined in 1963. When the Town of Antigonish and the Municipality of Antigonish County joined in1964, the region became known as the Pictou-Antigonish Regional Library. 1964 - The NEW GLASGOW LIBRARY and the REGIONAL HEADQUARTERS moved from the Carmichael Building on George Street, to the present location, and with the expansion in 1990 became known as the NEW GLASGOW LIBRARY COMPLEX. 1965 - TRENTON LIBRARY moved from the former Police Department Building on Main Street to its present location in the Civic Building. 1971 - A SECOND BOOKMOBILE was added. 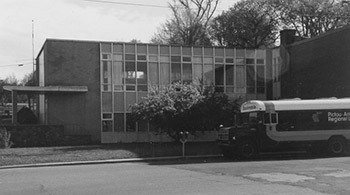 1972 - The ANTIGONISH LIBRARY moved from the former Knights of Columbus Building on College Street to its present location in the Town Hall Building and expanded in 1989. 1973 - The WESTVILLE LIBRARY moved from the former Town Office Building on Church Street to its present location in the Civic Building. 1980 - The PICTOU LIBRARY moved from the Sellers Building on Coleraine Street to its present location in the Civic Building. 1985 - BOOKMOBILE service to rural schools withdrawn and rural service provided through ONE BOOKMOBILE. 1986 - The RIVER JOHN LIBRARY opened becoming the first rural branch library in the region. The library is located on the main street in the Lion's Club Building. 1987 - The STELLARTON LIBRARY moved from the former Miners Museum, corner of Park & Acadia Avenue, to its present location on Foord Street. 1991 - BOOKMOBILE service concluded. 1992 - BOOKS-BY-MAIL Service to Antigonish County began. 1994 - BOOKS-BY-MAIL Service to Pictou County began. 2000 - ANTIGONISH OUTREACH SERVICE began. Monastery Rural Access Site located in the East Antigonish Education Centre opens. 2001 - RIVER JOHN LIBRARY AND INNOVATION CENTRE moved to new building. 2002 - VIRTUAL LIBRARY SERVICE www.parl.ns.ca launched. 2003 - PICTOU LIBRARY expansion and renovation is completed. 2005 - WESTVILLE LIBRARY moves to the former Queen Street School, which is the new Town of Westville Civic Building. 2010 - NOVASTORY.CA is launched to hold all regional library digitized materials. 2010 - NEW GLASGOW LIBRARY expansion is completed with the addition of a new street facing seating area, community program room, and heritage centre. 2011 - ANTIGONISH TOWN AND COUNTY LIBRARY, popularly known as The People's Place, opens on Main Street.